AMP Capital Shopping Centres completed a $440 million redevelopment of the Macquarie Centre in Sydney’s North Ryde during 2014. As a part of its focus on creating unique places and experiences for shoppers, AMP approached place based media and LED display consultants, Digital Place Solutions, to develop a suite of displays that would enhance the centre and in particular assist create an iconic display in a new part of the centre. A key element of the redevelopment was the inclusion of three large format LED screens including an iconic 21m x 3m curved LED digital display in hi-resolution 6mm pitch, a first of its kind in Australia. 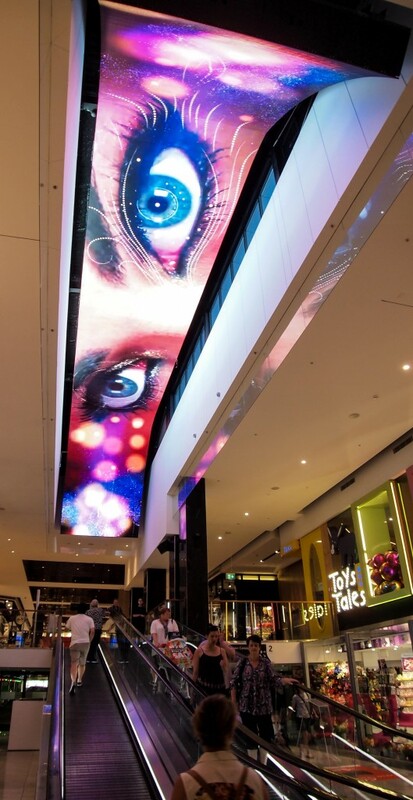 Digital Place Solutions worked with AMP Capital and Panasonic Australia to develop the network of internal and external hi-resolution LED displays that responded to the brief and could be supplied and installed in parallel with a challenging construction program already underway. The iconic curved digital screen provides an experience that engages shoppers like never before. The overhead digital screen is fully animated, so television footage can be adapted and used with audio to create a huge impact. “We had high aesthetic benchmarks to meet and a traditional display wouldn’t have cut it from that point of view. What made it more difficult was the location, which posed a challenge in terms of physically installing the panel on the ceiling,” added Mr. Rubie. 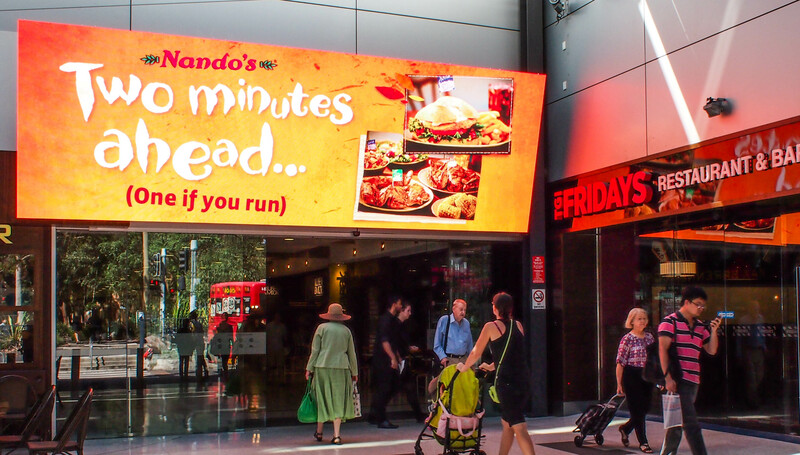 Two other LED displays were completed in time for the busy 2014 Christmas shopping season. One an external 6m x 2m in 6mm pitch is situated above the Herring Road entrance that carries very large numbers of shoppers daily and the second a curved external display of 13m x 3m in 10mm pitch situated on Waterloo Road, a busy artery servicing Macquarie University and Macquarie Business Park and adjacent to a major entrance to the shopping centre’s car park.